Happy new year, everyone!! I know, I know, it has been a while since my last post. My life has been quite hectic lately – Kev moving to Olds (a small town north of Calgary), us planning our wedding in the fall (yay! ), booking flights and hotels for our upcoming trips to Asia, my computer crashing down…etc. BUT I didn’t forget you. There are so many things I eagerly want to share with you and I finally found some time to start blogging again. 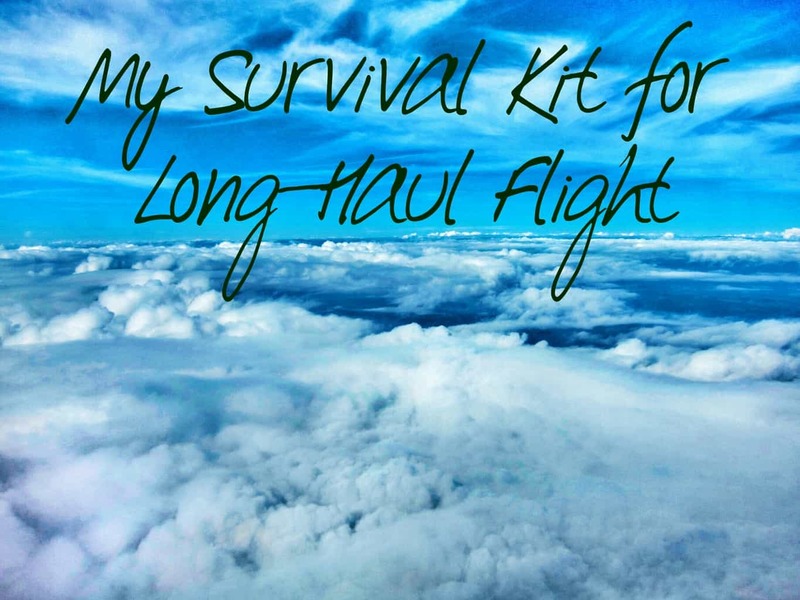 What are My Survival Kit Items? Something that helps me stay moisturized – the cabin air is very dry so I always bring lip balm, travel-sized lotion and facial mist to protect my skin. Something that makes me comfy – Neck pillow is a must. Besides wearing comfortable flats, I will also pack a pair of disposable slippers. For girls, I will suggest bringing along a blanket scarf that is big enough to use as a blanket! Something that helps me sleep – I usually bring a tiny bottle of essential oil to help me sleep (chamomile, ylang ylang and lavender are good for relaxation and stress reduction). If you have trouble sleeping and want to minimize the terrible symptoms of jet lag, try taking some sleep aids like Gravol to help you sleep (beware of negative effects though; it might make you feel groggy). Once you have landed, you can take Melatonin to regulate your body clock. Something that helps me stay fresh – Practicing good personal hygiene reduces the risk of catching or spreading a disease. Travel-sized hand sanitizer, tooth brush and tooth paste as well as facial wipes are essential. Something that keeps me entertained – Besides sleeping and eating, what can you do in a cabin? I usually bring a light-hearted, fun book to read. Also, I will make sure I have downloaded fun games and my favorite music onto my phone or iPad! Of course, upon landing, if the airport has a convenient public transit system that takes me directly to my destination, or has car rental services available (e.g., RelayRides in the states), it will make my trip so much easier. Now it’s your turn! Share with me your must-haves! Link-up //WeekendWanderlust // Big thanks to A Brit & A Southerner and other co-hosts. For more travel posts, please click on the image below. I love the idea of disposable slippers…I’m adding that to my list. I *must have* my noise-cancelling headphones – not only do they make the vieing experience of inflight entertainment much more pleasant and comfortable than it woudl be using the airline supplied headsets, they also block-out all the engine and cabin noise which makes it so much easier to relax. Headphones are so crucial to me too! I am super sensitive to noises. Some airlines do not give out free headsets so I always make it a habit to bring my own. I always bring a scarf that doubles as a blanket! It gets so cold on airplanes! Totally agree! I don’t like to use the blanket the airline provides because it has that airplane smell that always make me feel sick. These are fantastic suggestions! We’re going to be taking a longish flight to Italy in a couple of months, so I’ll keep this in mind. I like the essential oils idea!